This untitled map shows the route of the journey made from Siam to Brest by the French Ambassador for King Louis XIV to Siam, Alexandre, Chevalier de Chaumont in 1686. The journey taken is shown by the dotted line going through a large area of the South Atlantic (the distance between Ascension and St Helena alone is close to 750 miles). 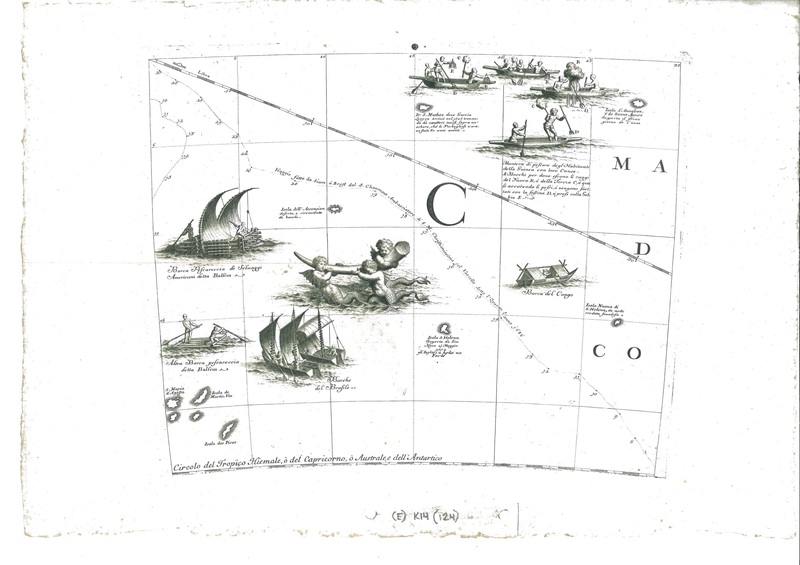 The map is undated but comes from the Libro dei Globi, by the Venetian cartographer, globe maker and Franciscan Monk Vincenzo Coronelli, published between 1683 and 1704. The map centres on the islands of St Helena and Ascension, discovered by the Portuguese in the previous century, important lands that break up the hazardous journey across the Atlantic. As well as the cartographic detail on display the map also features boats from Brazil and the Congo and fishing vessels from Guinea. 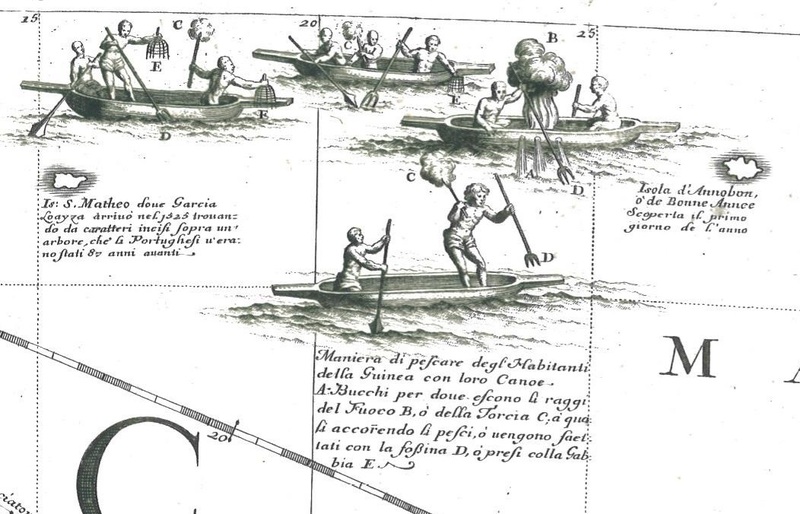 Using fire as a way to attract fish to the boat the fishermen then spear the fish using a trident. One boat has a fire burning inside, with holes to allow smoke into the water, presumably to stun the fish. In the middle of the map are a group of putti, winged spirits (this time with additional fishes tails). Usually shown engaged in an activity here they are carrying a piece of Elephant ivory. Coronelli was a highly acclaimed maker of globes, with commissions from the great families of Europe, Louis the XIV amongst them. The Libro dei Globi is an atlas made up of the maps which were drawn for the globes. 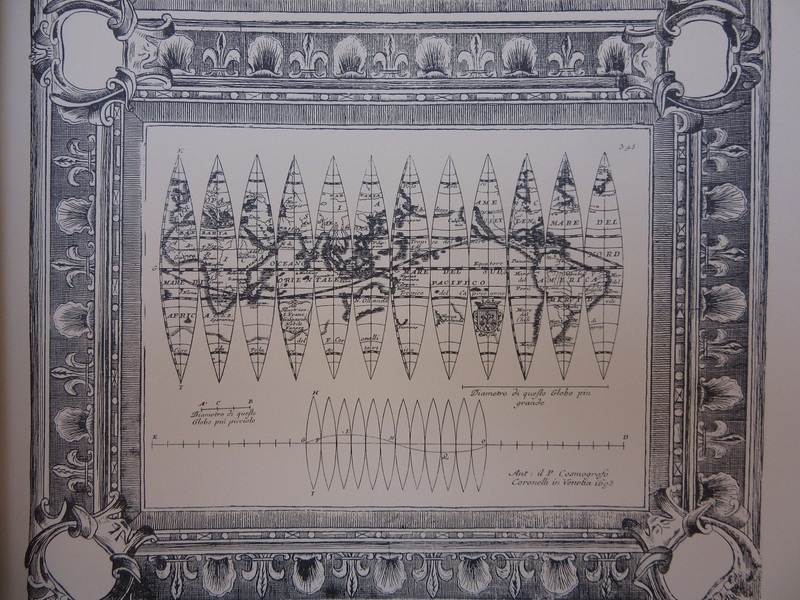 More correctly called Gores, the sheets are cut to fit around a spherical ball, hence the shape of the map shown here. This entry was posted in Cartography, Exploration on 10 August 2016 by stuart.